In today’s increasingly heated midterm elections, advertising spending is also heating up — and the dollars are being spent in surprising areas, say leading political media reporting organizations. According to Borrell Associates, spending in 2018 is 6.5 percent higher than in 2014, with total spend estimated to be $8.8 billion versus $8.3 billion in the previous midterm elections. What’s more, digital is not king, despite massive growth during the last two cycles. 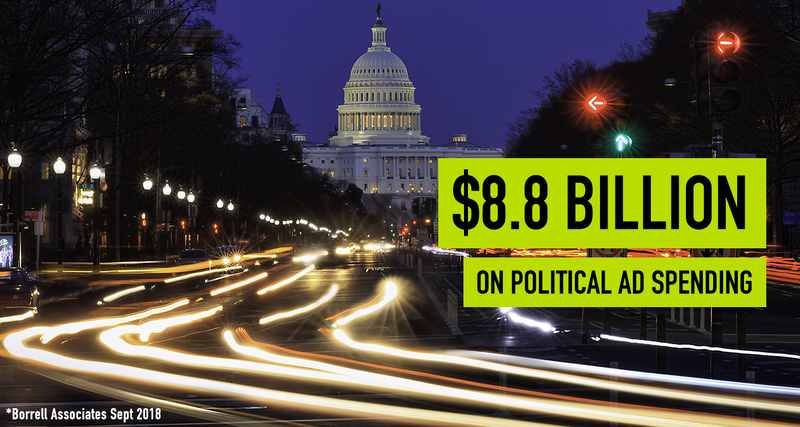 Broadcast and cable are capturing over 50 percent of all political media revenue. Online and digital account for 20 percent. Often overlooked print and radio advertising fall in at 8.1 and 7.7 percent respectively. The breakdown continues with $2.4 billion predicted to be spent on broadcast TV ads, including House, Senate, and state and local office races — a 14 percent increase from 2014, according to Kantar Media as reported by Bloomberg. Further, campaign spending on local cable TV ads will grow more than 40 percent to $850 million. Expenditures for Internet ads will more than double to reach $600 million. More than half of political spending will be local — state level or below. In fact, Borrell advises media and consultants to understand local audiences, so they can deliver highly targeted matching of ads to audiences. To help media take advantage of the increasing midterm political spending, FastPay provides several critical capabilities that support automated delivery, receipt and processing of prepaid political advertising payments. Because FastPay is designed for the media industry, its proprietary technology serves its unique payment needs — including reducing the risks of political ad payment delays and discrepancies. As an added measure of assurance, the FastPay services team follows up to ensure payments are processed in advance of airing ads on TV, cable, online, digital, radio and print. FastPay further reduces payment risk by offering the ability to automatically populate payment portals with billing information versus relying on human intervention and risking potential payment errors and delays. While the political landscape is bound to become increasingly volatile up to November 6th, 2018, paying for political advertising along the way doesn’t have to be.